Great sleep is built on solid foundations. As sleep experts, we understand this and that's why we develop sleep solutions for every layer of your bed. With a wide range of options designed to meet your specific needs and allow you to get the sleep you deserve. A mattress is the foundation for a sound night’s sleep. Don’t believe the hype, there is no one-size-fits- all, several factors come into play when choosing the perfect mattress. It’s important to choose a construction that is comfortably supportive for your body and your sleeping position. Those who sleep on their back may need a firmer surface compared to front sleepers. Start with your spring count, generally the more springs the more responsive the mattress will be to your body. Pocket sprung systems encase each spring so they individually respond to your body. Then pick fabrics and fillings that address your specific bedtime needs. Natural fills like wool, silk and cashmere help regulate your body temperature. Latex and memory foam add both comfort and support, by moulding around the contours of your body, essentially cradling you for increased support. All our mattress are sold with a 100 night trial guarantee so you can rest easy. Bigger really is better when it comes to mattress and bed base choices. Whether you share or not, the more space you can give yourself in bed the better. Ensure that you check that the weight of your mattress can be supported by your existing bed frame. A topper is a great way to add an extra layer of support and/or comfort to a mattress. Selected ranges can help add additional warmth or regulate your temperature while you sleep. Firmer toppers will add extra support to your mattress, perfect for aligning your back and spine during the night. A softer topper will provide supple comfort, making your bed luxuriously cosy. Natural fills such as wool will offer breathable, temperature regulating properties to help keep you at the perfect sleeping temperature. Feather and Down fillings offer brilliant support and down-rich fills add great insulation. Synthetic ranges help provide a comfier nights sleep, choose our Memory Foam topper for the ultimate support, designed by Nasa to give you ultimate weightlessness. It’s important to choose the same size topper as your mattress so it fits perfectly preventing it from slipping or moving whilst you sleep. Our toppers lie on top of your mattress with sturdy elastic straps or slip resistant surfaces to help keep them in place. Becoming too hot or cold during the night can disrupt your sleep or cause you to wake up feeling uncomfortable. It is essential you choose the correct duvet tailored to your individual sleeping habits and sleeping environment. An array of duvet fills are available depending on your personal sleeping preference, including moisture wicking properties, breathability and temperature regulation. All our duvets are carefully designed to help you get the best night's sleep, with each fill providing different benefits. Silk, wool and cotton provide breathable, moisture wicking and temperature regulating properties. Feather and down helps to provide insulation, with high down counts providing a lightweight duvet. The synthetic filler, hollowfibre is a great value alternative which mimics the indulgent, cosy qualities of feather and down and is great for allergy sufferers. It’s important that you adapt your duvet tog during the seasons as well as your room temperature whilst you sleep. The lower togs (4.5 to and 9.0) are great for warm summer, spring and autumn months or those who tend to get hot at night. The higher togs (13.5 +) are great for chilly autumn and winter months or those who get cold during the night. An all-seasons set is great for all year round flexibility, consisting of a 4.5 tog and a 9 tog which can be used individually or attached together. Choose your duvet size to match your mattress size. If you like to snuggle in to your duvet or sleep with a duvet-hogger go one size up! Your pillow plays a key role in your overall comfort during the night. It is important to support your head, neck and shoulders whilst you sleep. Choose a fill depending on your sleeping position, comfort and fill preferences. We're confident we've got the right one to suit your needs. Different sleeping positions require different amounts of pillow support and depth to help align your spine, neck and head. Those who sleep on their back require a flatter and slightly softer pillow a medium-firm option would be best. Side sleepers should should sleep on a firmer pillow, making sure your neck is not taking the weight of your head. Choose a softer pillow if you sleep on your front as a flatter surface will support the head and neck correctly. Those who suffer from back pain may want to sleep with a soft pillow under their pelvis to prevent back ache. Your choice of filling can increase or decrease the firmness of your pillow as well as altering the comforting touch of the pillow. Softer fills such as Feather & Down and Microfibre are squishy and soft. For a firmer finish, natural and feather rich fills or ‘chambers’ add support. Our Anti-Allergy pillow helps banish bugs and allergens so those with allergies can enjoy a peaceful sleep. From natural to synthetic, we are sure you’ll find the perfect pillow. From pillow-pairs to squares, we have a variety of pillow sizes and shapes to suit all bed types and sleeping preferences, home and away. Given that you sleep with these sheets every night, it’s worth investing in good quality. Bed Linen is not just for aesthetic, the sheets you sleep with can play a huge part in your sleep comfort. Your bed linen should be soft against the skin and made from a breathable, high quality fabric to ensure the most comfortable night's sleep. Fall in love with your bed again with our beautiful ranges of bed linen. Our Egyptian Cotton has a soft smooth fabric with strong fibres for hotel quality. Our french Linen is a chic, smooth, breathable fabric great for creating that relaxed bedroom feel. Sleep soundly with the highest quality bed linen by your side. Whichever look you are aiming to create, Soak&Sleep provides a variety of styles to help. Our plain bed linen ranges help create a perfect base for both sleek and relaxed looks and come available in a range of colours and classic white. Patterned, printed and embroidered bed linen helps to add character, texture and style to the bed. From pillowcases to fitted sheets you can style your bed with the highest quality bed linen. We also stock special UK and European sized pillowcases and sheeting. Built to last, so you can rest assured you’ll have a good night's sleep, every night. 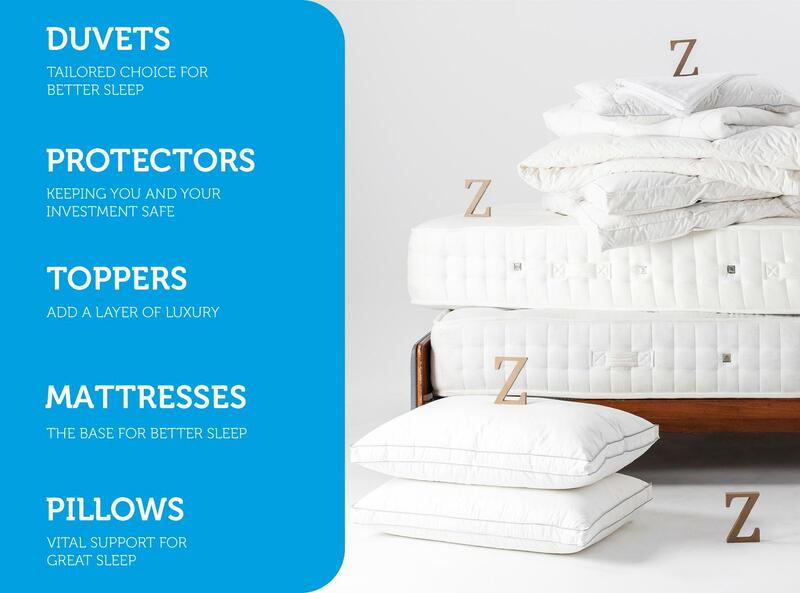 Protectors help maintain your bedding protecting them against accidental spills and stains. Selected ranges also have temperature regulating and/or breathable properties to keep you comfortable at night. Allergy suffers can sleep soundly with our Anti-allergy protectors, treated with Sanitized solution to ensure no nasties have the chance to develop on the fabric which is closest to, or touching your body whilst you sleep. Warm sleepers can be kept cool during the night with our Coolmax protectors. A layer of Coolmax helps draw heat away from your body keeping you cool and fresh whilst you sleep. Keep your mattress, pillow and duvet protected so you can sleep easy knowing your bedding investment is safe. No matter how big or small your bedding is, it’s always worthy of protection. Our range includes extra deep protectors to accommodate toppers as well as deep mattresses and specialist UK and European sizes. Choose your size and start your journey to better sleep. We spend a huge proportion of our lives in our beds, so getting the foundations right is key for all our bodies. Research has proved that good sleep improves memory, helps you live longer, maintains a healthy weight and benefits your heart and immune system.